Here is another marvellous automaton! 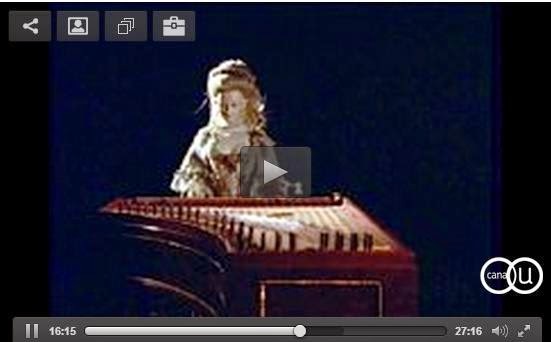 Video, made to accompany the Metropolitan Museum exhibition of 2012-13, showing the Dulcimer player "in performance". The height of figure is 53 cm. This beautiful automaton from the Musée des arts et métiers was the fruit of a collaboration between the celebrated German cabinet maker David Roentgen and the clockmaker Peter Kintzing. Created in secret at Roentgen's workshop in Neuwied near Coblenz, it was presented to Marie-Antoinetteat Versailles in 1784.. 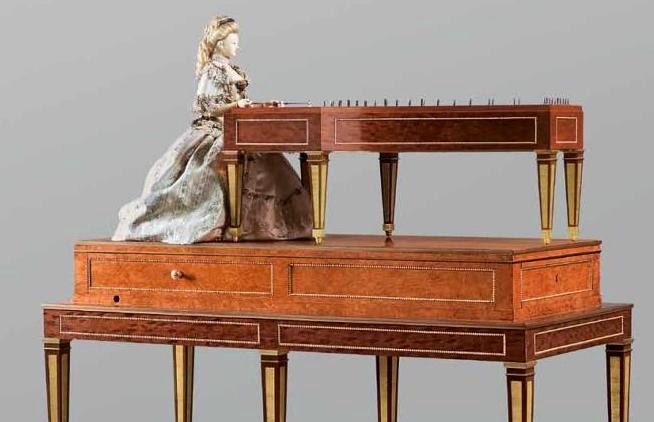 In a letter of February 1785 Prince Johann Friedrich Alexander of Wied-Neuwied reported that David Roentgen had demonstrated to the French court "a doll that plays music on a clavichord" (in fact it is a percussive instrument so more properly a dulcimer). The piece was valued by Roentgen at 800 louis d'or, though he accepted a mere 500. The queen, aware of its scientific interest (or possibly not knowing what else to do with it!) promptly deposited in the cabinet of the Academy of Sciences in March 1785. Roentgen himself was rewarded with high honours - he was given the title of royal ébéniste-mechanicien in 1779 - and Kintzing was named clockmaker to the queen. 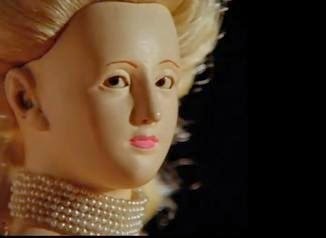 The mannequin clearly bears a strong resemblance to Marie-Antoinette - according to a (probably spurious) tradition it uses locks of her actual strawberry blond hair - and is in itself a virtuoso creation; the dress, which conceals the mechanism, incorporates 20 metres of tiny intricate lace which was laboriously restored in 1993. Roentgens's cabinet is also recognised as a masterpiece of veneered woodwork. Restored imperfectly in 1864 by the illusionist Jean-Eugène Robert-Houdin, it was thoroughly restored In 1993. The original music was reconstructed from the system of cams and pins on the cylinder using an audio MIDI processing system. A 25 minute documentary was produced by CERIMES showing the process - see the excerpt below. (There are no English subtitles but you can get the general idea without understanding all the French.). The mechanism was adjusted but, like a real musician, the dulcimer player was allowed to retain her imperfect performance! Notes and video from the exhibition, "Science and curiosities at the court of Versailles", 7 December 2010-11 March 2011.